distinguished guests at a special ceremony in Hamburg. the latest state-of-the-art technologies including new generation engines and Sharklets, the A320neo Family provides 15 percent fuel savings at delivery and 20 percent by 2020. 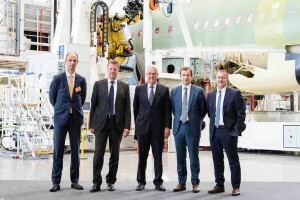 To date the A320neo Family has captured nearly a 60 percent market share with more than 6,000 orders from 100 customers.